A couple of weeks ago, we had a short break in Dumfries and Galloway. 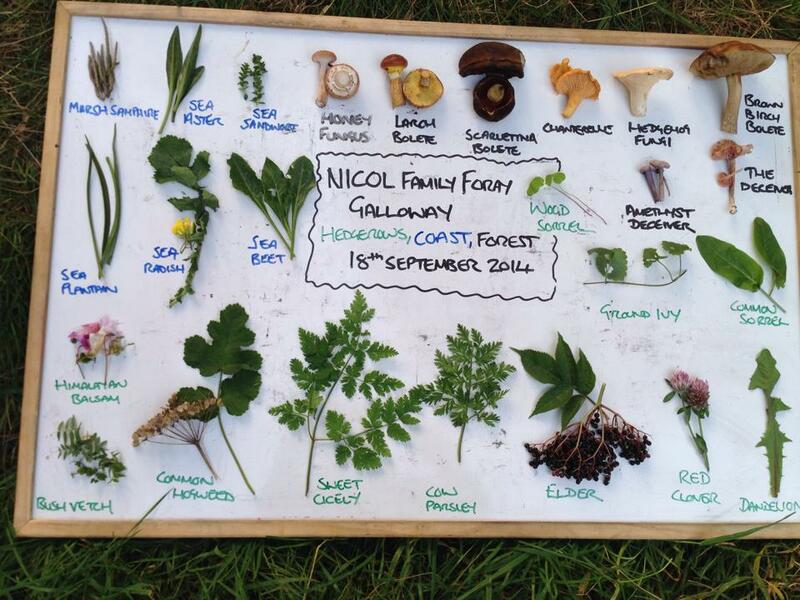 The highlight of our trip was a day spent foraging for wild foods around the hedgerows, forest and seashore of Galloway with Mark of Galloway Wild Foods. Mark was incredibly knowledgable and enthusiastic about all things foraging. The day started with us meeting over tea and cake made from hogweed seeds and tasting something like ginger parkin as Mark asked about how we’d like to plan our day. I think he liked the fact that we were interested in our food too and were keen to learn as much as we could. We started in the garden, finding sorrel and sea beet, then ventured onto the hedgerows to taste and pick cress with a real mustard bite and discover some of the many uses of common hogweed, as well as spotting sweet cicely and cow parsley. Mark was great at sharing his knowledge and tempting our tastebuds with a range of flavours, all just plucked from the verges. This is a man who will never go hungry! We took a short drive towards the seashore, donned wellies and ventured out onto the muddy flats where we collected marsh samphire, sea plantain and sea aster, which would fill our seashore sushi later in the day. With Mark’s help, we were soon looking at our surroundings with new eyes. Down by a rocky foreshore, we found sea radish and three different types of edible seaweed including the incredible pepper dulce, or truffle of the sea. This rather unprepossessing looking brown growth on the side of the rocks has the most amazing truffle-like taste. We only half joked that we’d be licking the rocks back here in the North East. I really hope I find some locally. All through the day, Mark kept bringing out things from his collecting bag for us to try. He’d brought along a selection of syrups, fruit leathers and alcoholic tipples that he’d created from stuff he’d collected, and so we grazed and drank our way through the day. Our last stop was in a community forest for a mushroom hunt. Obviously something to do with an expert, but actually it’s not so daunting as you think to start identifying some common types. We did find a lot of not very tasty, and ‘really you don’t want to eat that’ specimens, including the fly agaric, which is your classic fairy-tale red and white topped version. 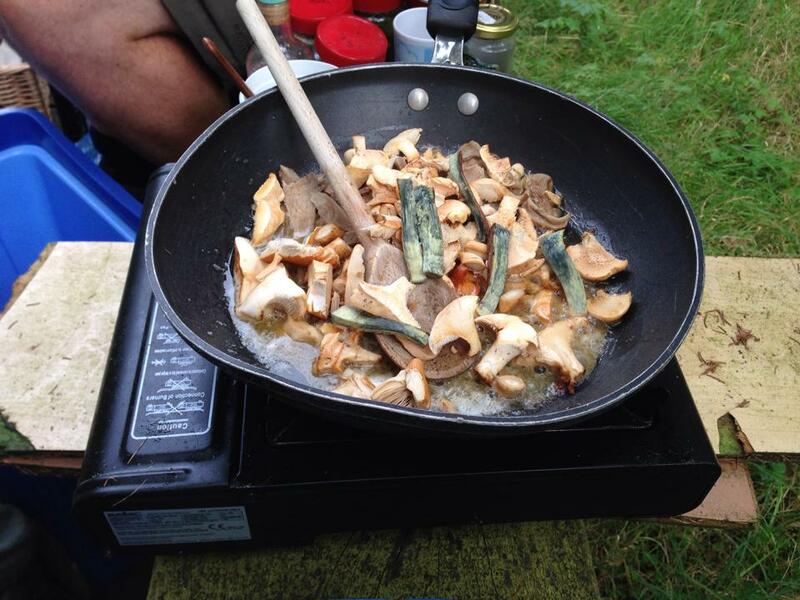 But we also found some lovely edible ones, including a couple of chanterelles, the common hedgehog mushroom, and the very pretty tiny purple deceiver mushroom, which Mark cooked up for us at the end of the trip. One of my favourite things was the wood sorrel, which tastes like apple peel and could be found almost everywhere we walked. It was a brilliant and eye-opening experience. I don’t think I’ll look at a hedgerow in quite the same way again. I’ve been spotting hogweed on my drive into work, and am keen to go exploring on some traffic free areas to see what I can spot. If you’re interested in food for free, or like to mix your own drinks and flavours, then I’d highly recommend it.